FileMenu Tools has more than 30 built-in utilities to perform any operation on files and folders that you can imagine (move/copy files to another folder, sync folders, batch renaming, copy path/name to clipboard, shred files, view size of folders, split files, generate checksums, and much more). And if the built-in commands don’t cover your needs, then you can add custom commands, submenus and separators to completely customize the context menu. You have total control to customize the custom commands like menu text, icon, element types, modifier keys, arguments, working folder, multiple instances, administrative mode, etc. You even can configure the “Send To…” submenu or enable/disable commands added by other applications to the context menu. I agree! it is much easier for a user, to take their time deciding whether to add a feature or features, during their own spare time, as opposed to having their workload interrupted and being forced to learn about all the features at once, and to attempt to ascertain whether they are causing any problems. Perhaps a better alternative would be to have the user install the generic program and then have a wizard walk the user through each of the choices for addition to the context menu? It would also be desirable to let the user know in advance that a re-boot is required. that way, they can install at a time when their workday and work flow will not be interrupted. I love the idea of the program, but do wish there was more consideration of an individual’s flow of work. A context menu is a menu in GUI that appears upon right-click in Windows operating system. A context menu contains a limited set of options and choices depending on the current state, or context, of the operating system or application to which the menu belongs. Windows context menu can really come in-handy and boost productivity, if and only if you could decide what the menu should contain. It’s not an easy task to manage it from within the Windows, and may be to complex for novice users. But there are third applications that can help you manage it. 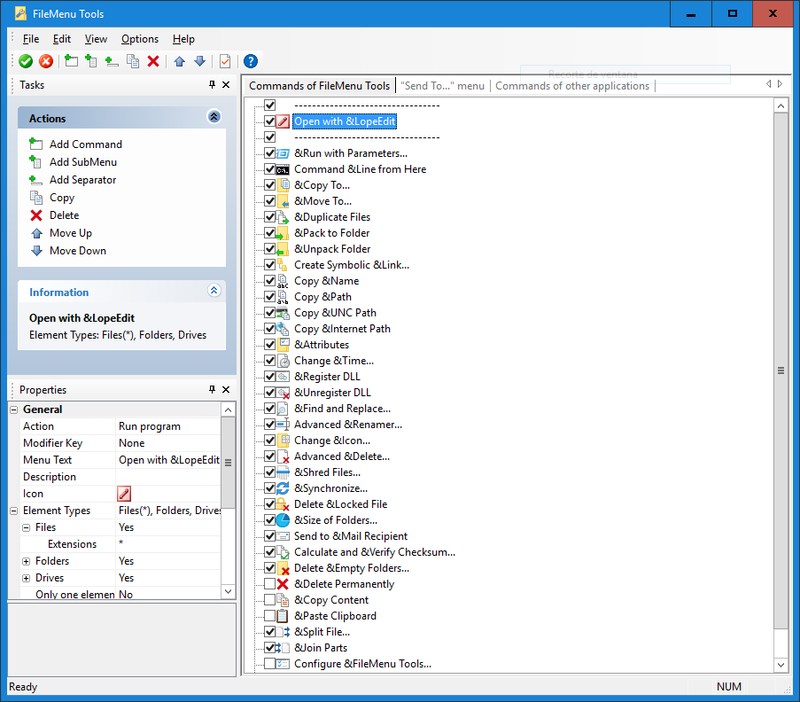 FileMenu Tools is a software application designed to help you customize and manage Windows Explorer context menu. It allows you to add your own items and shortcuts to improve your workflow and productivity. Even the novice users should be able to use the application without any problem. The installer size is ~15MB and the installation process is simple and straightforward, taking no time at all to complete. After launching it for the first time, you can enter your license key to activate the ‘Full License’ of the application for use. Once done, you can start using the application to make your Windows Explorer context menu look the way you want it too. The UI of the application is clean, well organized, and intuitive, making it suitable for all types of users to use. At the top is the menu bar with usual drop down menus, followed by toolbar that contains important commands. On the left side, there are two tabs, one that lists all the actions you can perform, and the second one which let’s you adjust properties of the selected context menu entries. On the right, the big pane is divided into three tabs, namely ‘Commands of FileMenu Tools’, ‘Send To… menu’, and ‘Commands of other applications’. From here, you can hide/show a specific entry, add new commands, add submenu, add seperator, move commands up/down the list, delete them, and more. You can even test a certain command, this comes in handy when you are adding a new command to the context menu. – Simple and clean UI, which is easy to use. – Add custom commands which run a specific action like Run external applications, Copy/move to a specific folder, Delete specific file types, Send the selected files as attachments to e-mail recipient(s), Rename the selected files using a set of rules. – Configure and manage the “Send to…” submenu. – Enable/disable commands added by external applications to the context menu. – Ability to add built-in utilities that perform operations on files and folders, some of them are: Sync Folders, Extended delete, Find and Replace, Advanced Renamed, Locked file Delete, Delete permanently, Split/join files, Copy/Paste/Cut/Move, Shred files, Calculate and Verify Checksum, and more. – It changes the context menu as soon as it is intalled. – Adds it’s own sub menu automatically, which is a sub menu with commands that have further sub menus. 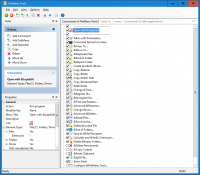 FileMenu Tools is a reliable and effective application when it comes to managing your Windows Explorer context menu. The application is easy to use and understand. It runs smoothly, without running into any lag or crashes. It is definitely recommended. I don’t get the problem. Just open the program and uncheck the items you don’t want in your context menu–it only takes seconds! You might even find some ones you didn’t think of which you would like….:-)…. Wish I could paste a screen capture for you….. Highly recommended by a 3 star rating? Yes, it is a very, very good software. and download portable version, You can register with the given key. This software is very mistaken in its behaviour. It changes your context menu as soon as it is installed. On my PC, in Windows Explorer, it sticked a File Menu Tools submenu with many new commands (and more sub-menus), and added big undesirable icons to existing commands. In Directory Opus, changes were fortunately more limited, but different, which in itself is unsettling and not conducive to ease of use. I suppose those changes are reversible, but that’s the point : you shouldn’t have to dig immediately into the help file and search frantically for the chapter “Undo the stupid changes you’ve just done to MY system, without even having the courtesy to ask”. Chapter which is nowhere to be found, of course. And there’s no Undo command, either for changes inflicted by mere install, or for conscious changes made by the user. The Help file is very lacking. It only deals about the changes you can make to your system. It has absolutely nothing on the interface of the software itself. Despite being apparently self-explanatory, the interface is not. For instance, in its original state, there is a Properties panel. Testing the program, I clicked to close it. Now I can’t find the way to bring it back again, and the help is mum on the subject. Once again, message to developers : don’t act as if you owned your users’ PCs. You don’t. Your software is not the only one which gets installed on their computers. Hundreds of others have already been installed, and more will be. The user has already been using his PC, or others, for years or decades. He has thousands of hours of accumulated experience. He has his own way of doing things. He’s doing specific things that you don’t even have an idea about. And all your users are different in that respect. When I install a program to enhance the right-click context menu, that’s maybe 0.05 % of my mental bandwidth. I don’t use a computer to run a context menu. I know you have spent thousands of hours refining your context-menu handler, but that’s irrelevant to me. Now you’ve forced me to stop whatever I was doing, bring the right-click issue in front of my mind, and search frantically for ways to undo what you have undone, before getting to learn your software little by little to implement the changes that I would actually like to make. You’re forcing me to do things in the reverse order. I have to work hard in order to repair your mistakes, without being even sure that your program will help me solve my problems. Reading about your software, looking at the screenshots, I had a good impression of it and took the time to install it (which in itself is a not negligible piece of work). It’s even possible that my first impression was right and your software is rather good. However, I will never know, because now I have to uninstall it in order to repair what you have just broken. I have the tools in place to do that in a few seconds. If I were to try and do it with the tools provided in your program, that might take me hours, and I’m not even sure I would be able to succeed. Clairvaux, thank you for the ‘heads up’. I was about to install this software, but your comment stopped me dead in my tracks. I, like you, never dreamed this software would make changes to my machine, by just installing it. And the fact there is no easy ‘undo’, causes me great concern. I surely wish the program’s author had addressed your comment. His answer may have reassured me if he had provided a satisfactory explanation. Time is running out, so I hope for other’s sake he replies soon. FileMenu is an excellent Context menu tool which I am using since Win XP. It is no longer free, but very worth to pay for it (This is just for saying thanks for the developer). When installing it for the first time, it usually puts an FileMenu button on the desktop where you can open and configure the context menu. It is opening the program window and you just need to tick, move or untick the necessary context items you like. And need to confirm the changes with a click on the green button top left corner. And in the new menu context you see, there is also the point “Configure File Menu Tools” and follow same a m procedure. You can also summarize all FileMenu items in a single menue entrance with child menu. Just playing and trying a little bit, then it is becoming very intuitive and convenient . Easy Context Menu (EC Menu) at http://www.sordum.org is another great, FREE editor worth considering though it requires installation. By the way, there is a nice review at GHACKS.com, where I learned of this software. So you install software and you complain that it makes changes to your system? You don’t want any change? So don’t install anything. Your “review” is one of the lamest i’ve ever read. I was ready to download this but I’m not ready for the hassle it seems to present. Outstanding comment on how intrusive the software coders have made this File Menu Tools. I agree! it is much easier for a user, to take their time deciding whether to add a feature or features, during their own spare time, as opposed to having their workload interrupted and being forced to learn about all the features at once, and to attempt to ascertain whether they are causing any problems. Perhaps a better alternative would be to have the user install the generic program and then have a wizard walk the user through each of the choices for addition to the context menu? I’ve been using Filemenu Tools for a few years, and it really works well for customizing things like the SendTo context entries, as well as many other things having to do with Windows. I definitely recommend it to anyone who likes to tweak their installations. Not so much for the novice user. File Menu Tools is a fantastic tool. It opens a considerable amount of resources with the right mouse button, for operations with files. In addition to the pre-existing range of ready-to-use operations, you can still add new operations that meet your needs. I’ve been using File Menu Tools for years and it’s never been a problem. I recommend.